Can you believe that we’re nearly at the end of another decade? We’ve seen an incredible amount of change in the online world in the last ten years — from the impact of the smartphone to voice activated technology — and everything in between. What will this last chapter hold? 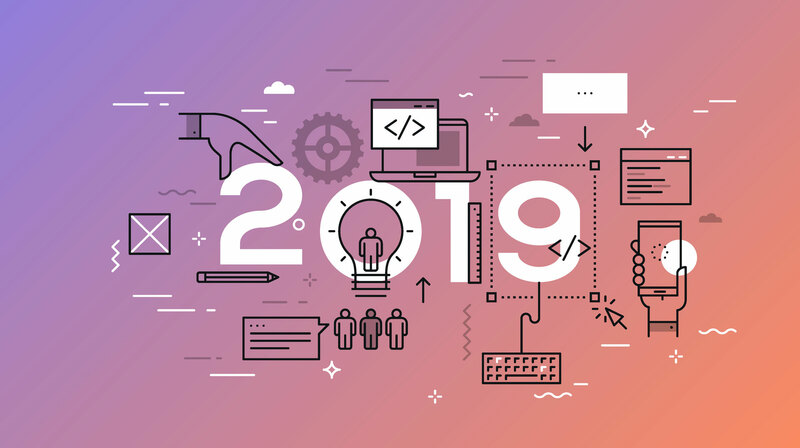 Let’s take a look at some of the key web trends we expect to rein in 2019. Since their emergence in 2015, Progressive Web Applications (PWA) have begun to blur the lines between websites and apps. PWAs are web applications that appear to users like a mobile app but are in fact websites. They aim to bring an app-like experience to users of all platforms and all devices, whether it be a desktop computer or a mobile device. Web technologies are developing rapidly and PWAs will only become more and more commonplace on the web in 2019. PWAs mean a faster, more streamlined user experience, offline website functionality and push notifications so it really is a great progression for the user. In an effort to capture and maintain the dwindling attention spans of users on the web, web designers are turning to motion to make their web pages feel alive and dynamic. The incorporation of motion encourages engagement and interaction between the user and the website. Motion also allows designers to provide additional feedback to the user such as indicators that advise content is loading or to validate input when incorrect details are loaded into online forms. Most of all, however, motion enhances the design of a website by giving it a unique feel. Especially right now while it’s still relatively new, this will help the site stand out from the crowd. Don’t take that as an invitation to add motion everywhere! Too much can be distracting and disorientating. Less is definitely more with this 2019 web trend. Move over flat design, 3D elements are the new web trend set to take 2019 by storm. Incorporating three dimensional objects further serves to make webpages feel alive, dynamic and to encourage interactivity from the user. The use of 3D space on a webpage also helps to give the user a sense of depth. 3D elements can be aesthetic — where they just serve the purpose of looking good and adding to the overall theme of a website, or they can be practical — such as 3D product mockups that users can interact with. Voice search has become an integral tool and we expect it to trend on the web through 2019 and beyond. Used most commonly in smartphones or home speakers (like Google Home), voice search enables search queries or the activation of functions on the device (such as to play music) using one’s voice. 1 in 5 adults use mobile voice search at least one time a month according to Global Web Index. Optimising websites to be compatible with voice search results will be a big element in the web world in 2019, particularly for SEO, as more and more users purchase devices with voice search capabilities built in. Ensuring that your website has implemented correct schema markup, also known as structured data, is a big optimisation factor. Essentially it is metadata — data about the information on your site, that is added to your website’s source code which helps search engines to organise and classify your content for voice search. As of June 2018, 55.1% of the world's population has internet access. From that 55.1%, there is a significant portion of users who live with one or more disabilities. Web accessibility means that all users are able to use and interact with the web unhindered. Increased accessibility is becoming more and more mainstream with companies such as Google and Apple providing accessibility guidelines for web designers and developers to follow.